This FM 2014 Player Profile of Juan Fernando Quintero shows one of the best playmakers in FM14, he has amazing technical skills and dazzling flair. During our test save Quintero developed outstanding technical skills, these are aided by 19 in creativity and flair. Best used in the AMC slot you could play this wonderkid as advanced playmaker, enganche or even shadow striker. I’d personally want to make Quintero the focal point of all my attacks, he is so hard to pick up and can create from nothing. Just a shame he recently joined Porto meaning he may be tough to sign straight away and costs a minimum of £35 million…that will eventually drop though. Juan Fernando Quintero Age: 20 Position: AMC Role: shadow striker / enganche / advanced playmaker Club: FC Porto Nationality: Colombian Value: £3 million Price tag: £35 million (in patch 14.3) CA: 137 / PA: 170 Juan Fernando Quintero profile in 2013 (after starting new game, 14.3) Juan Fernando Quintero profile aged 27 in the year 2020 Juan Fernando Quintero career history until 2020 This FM 2014 Player Profile of Juan Fernando Quintero shows one of the best playmakers in FM14, he has amazing technical skills and dazzling flair. During our test save Quintero developed outstanding technical skills, these are aided by 19 in creativity and flair. Best used in the AMC slot you could play this wonderkid as advanced playmaker, enganche or even shadow striker. I'd personally want to make Quintero the focal point of all my attacks, he is so hard to pick up and can create from nothing. Just a shame he recently joined Porto meaning he may be tough to sign straight away and costs a minimum of £35 million...that will eventually drop though. His stats age 20 are already worth 12 million. The little money Valencia paid for him is absurd. Colombia sure have some great up and coming talent. Couldn’t agree more, that was my first thought as I started doing Quintero’s profile as it was around the time I looked at Balanta. his stats at 20 ! I think we already have, should be in the lists. He does look like a good player but not developed enough in my test save. You should check out Leonardo Capezzi,Italian midfielder of Fiorentina,reminds me of a young Frank Lampard,my scouts say he has 4 and a half star potential and could be a star Bundesliga midfielder in the future. He does look talented, not quite good enough in our test save unfortunately but don’t think that is the players fault, more management. Yeah it was the same for me until I bought him,he done very well for me in the few games he has played for me before I loaned him out and he is continuing to develop. What a talent . And 12 million is totally a bargain for him. I agree, one of the best bargains this year. Can u also do a profile for James Rodriguez and Alvaro Morata? Certainly was a good swap. Rodriguez will get done at some point but there are other priorities due to his price tag among other issues. Morata hasn’t done enough in my test save for a profile. Unfortunately I don’t think £12mil is still the asking price, everytime i offered it they either said it was unacceptable or come back and said they wanted a deal in total of £33mil. Don’t worry, I’m sure it will drop as the game progresses, they have just signed him so that always bumps the price up an extortionate amount. who do you think better for AMC, he or adam maher? will there a profile of adam maher soon? he’s my previous favourite player though..
Haven’t profiled maher yet as we don’t have screenshots of him at full development, based on the info I have Quintero would be preferred. He is a real beast and untouchable in the right tactic. Thats some impressive assist tally right there. how can i can improve flair ? You can’t. That is a natural gift that is given and developed on its own. If there were a way I’d imagine a pro with good flair tutoring the player would be the way. Darren would he suited for the 4-4-2 and 4-3-3 tactic you developed? I think he’d slot right in as far as your 4-5-1 goes but I already have Januzaj, Hughes, Berisha for that role with Nicu (Steau) and Vadala (Boca) coming in during the summer. My plan is to make him an Attacking Right Winger, since he has all the attirbutes for it and I already have Barkley and Paredes in the middle. Good idea? I got him second season for 17mill! His assist stats are off the charts and it’s only December! I don’t know where else to type this, so I guess I’ll ask here: Do you have a profile for Angel Correa? I believe Johnny has one planned in the next week or so. I see…. That’s good news. Can’t wait to see his profile and development. Will Quintero be better than Coutinho for me at the AMC spot? I also have Holtby as my backup AMC. Also would Quintero convert to a good right winger/inside forward? I noticed that he is left footed. I think he would be better yes and he could be trained to play as inside forward from the wing too. Thanks for your advice Darren! 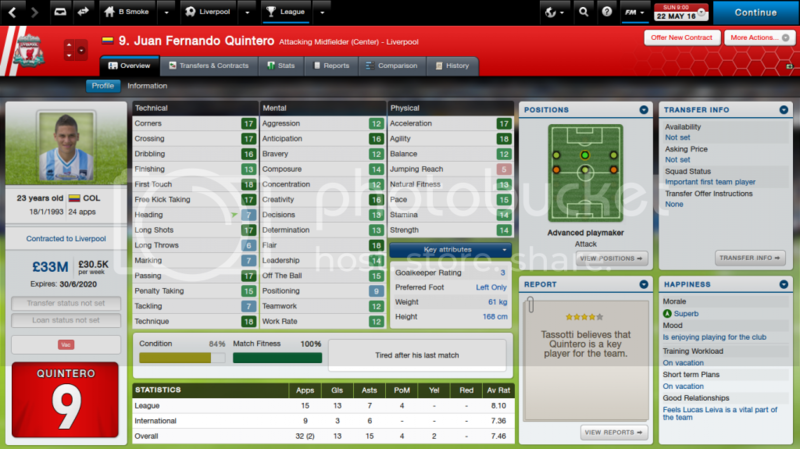 I bought Quintero in season 3 for 18.5m for Liverpool. And he has been immense early in the season! 2 goals and 1 assist in 3 appearances. I sold my backup AMC Holtby for 17.75m. So I got a huge upgrade on him for less than 1m!! I’m debating whether or not to sell Coutinho on as well or keep him as the backup as some other teams are sniffing around for his services. :-) Q seems to work a charm as the central cog inside your 2-3-1 dynamic tactic! And his high corners/free kick abilities are also quite useful. Glad he worked, certainly did for me and as you said he’s an added bonus from set pieces. Just wanted to update on the Q-man! Quintero quarterbacked Liverpool to a Premier Division title in season 3! He led the entire team in overall rating with a 7.46 overall and really makes your 2-3-1 dynamic tactic work! He has AMAZING stats already! Can’t imagine how much better he will get! Here are his end of season stats at age 23 and he is a total beast! He can get even better, really works well for me too. Absolutely incredible player. I bought him for Liverpool second season for £27.5M and he’s been unbelievable. I started him AM and trained him in MC and now he’s ‘natural’ in MC. I’ve got him in a 3-man midfield with Pogba and Matuidi and they’re just too good. He is amazing and that is one hell of a midfield three. This guy has become world class on my save, almost as good as Ronaldo and Bale. I signed him in the Jan transfer window and in 11 games he has provided 11 assists and 1 goal. I managed to get him for 13m + 2m depending on performances in the year 2016,so you might have to bide your time before making your move but if you have the moolah then definitely worth a punt. I’d put him in that bracket too, he can carry a team when used correctly.